For her part as a From the Ground Up Field Trip Leader, artist Liz Bernstein led an activity in the Oakland Columbarium and delivered a fascinating history of the pasty while handing out homemade versions of the traditional miner’s meal. A columbarium is a public storage site of cinerary urns. The word “columbarium” derives from Roman times; “columba” meant “dove,” or “diving bird.” A columbarium originally referred to a compartmentalized structure for the nesting of doves, similar in appearance to a burial vault containing urns of cremated human remains. Imagine a quarry starting off full and being slowly emptied of its materials. The columbarium is the opposite, it starts off empty and slowly becomes full of the physical remnants of the people who have lived. Patsies were the quintessential lunch for miners and quarry workers: portable, complete, cheap ingredients, and made of leftovers. The pasty came to the United States from Cornwall. When tin mining started going bad in England during the 1800s, Cornish miners immigrated to America hoping to earn their fortunes in newly developing mines. No one knows for sure whether the Cornish invented the pasty, or whether they picked it up from someone else. Mrs. R.F. Ellis of Cornwall insists her people invented it and that it is a diminutive of the star gazed pie, a type of pie baked with fish, such that the fish heads stick out of the pie. Others think the Vikings may have brought the pasty to the British Isles when they invaded. And another theory states that it may have been derived from the Italian “pasta,” since the Cornish were considered to be great seamen. Both Guivret and Eric came from various parts of what is today considered Cornwall. The pasty is now popular worldwide due to the spread of Cornish miners; variations can be found in Australia, the United States, Mexico and elsewhere. When the Cornish came to the copper mines of the Upper Peninsula, they brought with them a lot of mining knowledge. 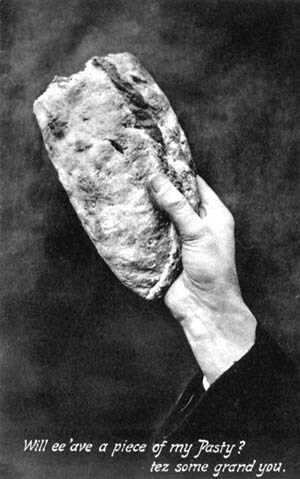 Many Cornish practices were then copied by the other ethnic groups, including the standard mining lunch: the pasty. It was small, portable, very filling and could stay warm for 8 to 10 hours. The Finns, Swedes, Irish, Poles, Germans, Scots, Italians and French all argue for different seasonings and ingredients in the pasty, but everyone agree that pasties must contain potatoes and onions. The portability of the pasty not only made it easy to carry, but if it should get cold it was relatively easy to heat up. One end of the pasty would usually contain a sweet filling, while the other end would contain meat and vegetables. Since entire Cornish families worked in mines and each member of the family wanted different ingredients in the pasty, a Cornish wife would stamp the bottom corner of each pasty with an initial, to mark both its owner and the “dessert” end. There was a superstition among the Cornish miners that the corner bearing one’s initials should not be eaten, instead it was dropped on the ground for the mining gremlins to eat. These “gremlins” caused mischief in mines, causing accidents and mine collapses, and feeding them supposedly kept them out of trouble. There is some value to this rumor. Early Cornish tin mines contained large amounts of arsenic, so by not eating the portion of the pasty touched by their arsenic-contaminated gloves, miners kept themselves from consuming large amounts of the poisonous substance.